The metal pieces are seperately strung on an elastic band. 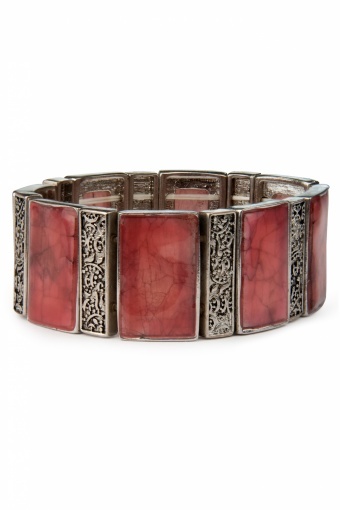 Antique Designed Mauve Gems bracelet silver. Very special bracelet in antique-look silver toned metal. The seperate shackles are strung on an elastic string and therefore easy to put on. The smaller shackles are decorated with pretty little ornaments and the bigger ones carry mauve coloured grained acrylic gems. De \'shackle to the max\'-ketting en de \'mauve gems\'- armband van mijn lieve man en dochters als verjaardagskado gekregen vandaag!